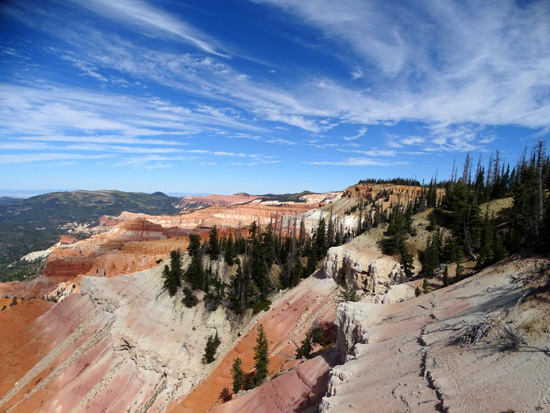 right as an amazing product of geologic forces." 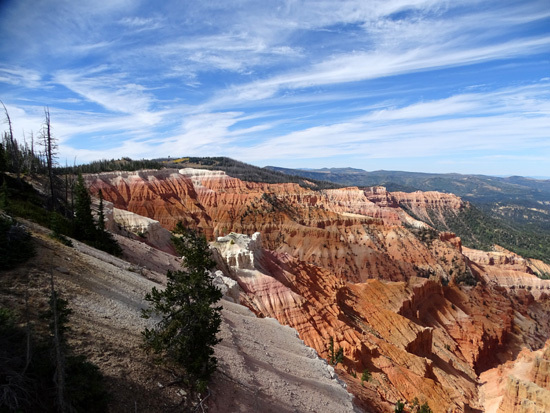 Cedar Breaks has many fewer visitors than either Zion National Park or Bryce Canyon National Park. 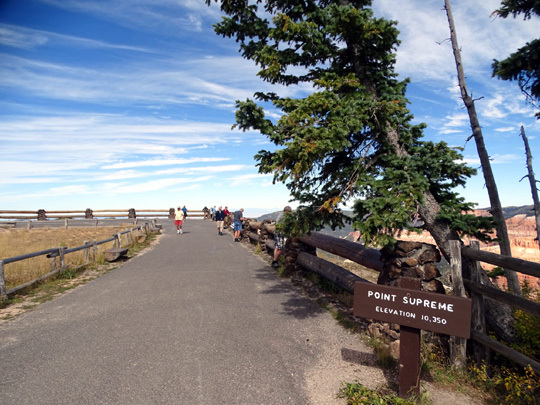 There is less to see, fewer trails to hike, and its season is relatively short because it's located above 10,000 feet elevation -- but if you're in the area it is definitely worth a visit of at least a couple hours to see the views from the four overlooks, or longer if you have time. 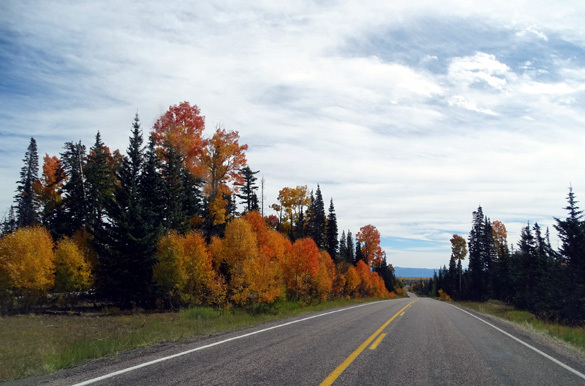 The drive getting there via Scenic Byways 14 or 143 is memorable any time of year. 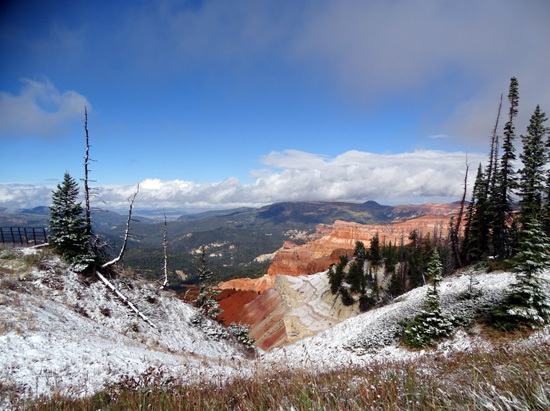 We saw lots of fall color in September and October, as well as some fresh snow at Cedar Breaks in early October. 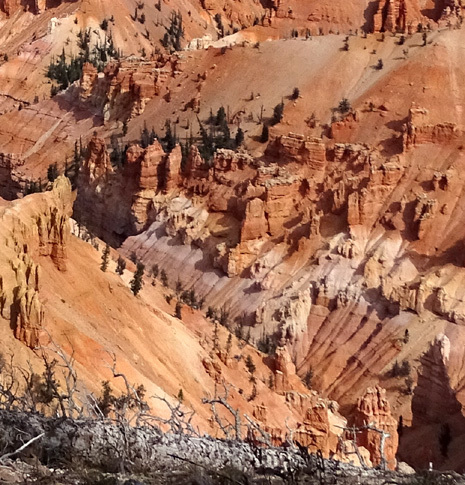 We visited Cedar Breaks twice this fall -- on September 21, when Jim rode his bike down Hwy. 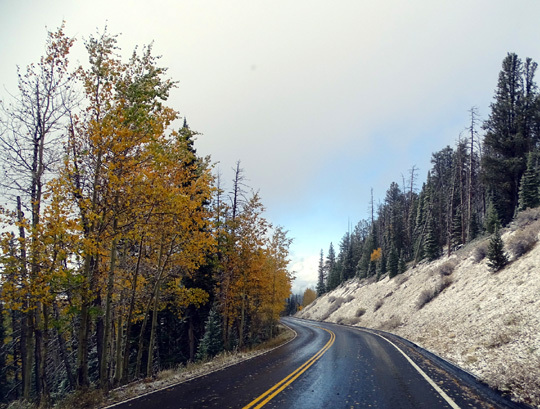 143 from Brian Head to Panguitch, and again on October 5 so we could see the winter's first snowfall. The photos in this entry are from those two dates. 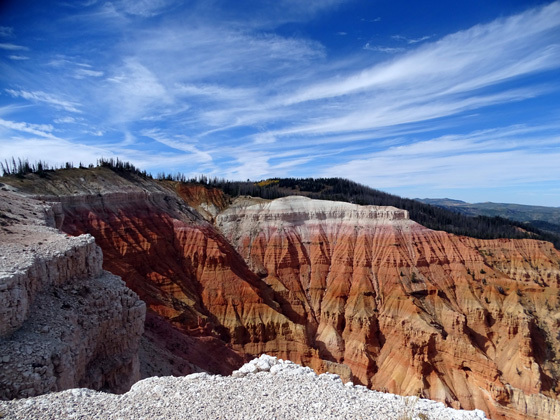 Cedar Breaks is bounded on two sides by Hwys. 143 and 148. Hwy. 148 is shown on the map above but it isn't marked. 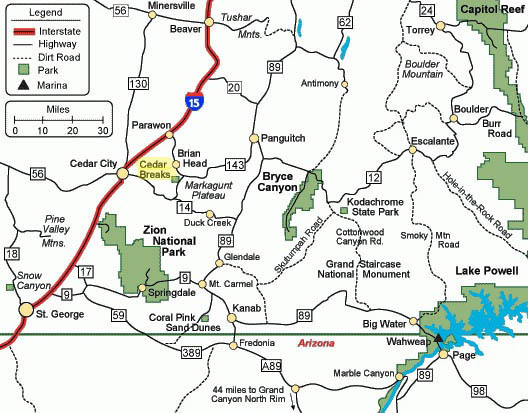 It's about five miles long and connects Hwy. 14 to Hwy. 143. 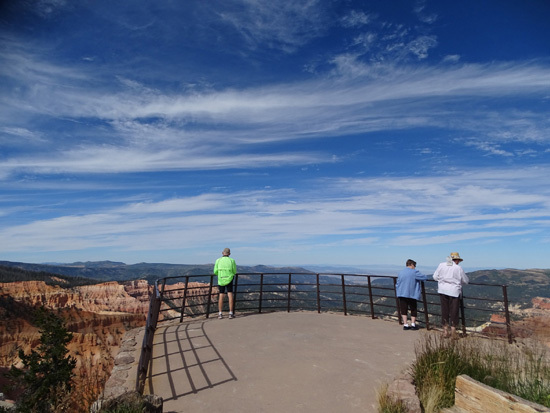 There is one overlook on the north side of the amphitheater along Hwy. 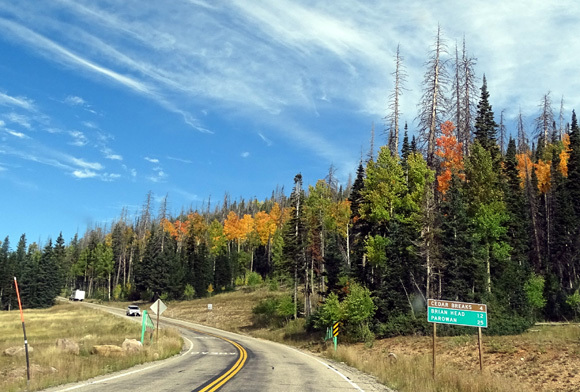 143 near Brian Head (the mountain) and three overlooks plus a visitor center and campground along Hwy. 148. 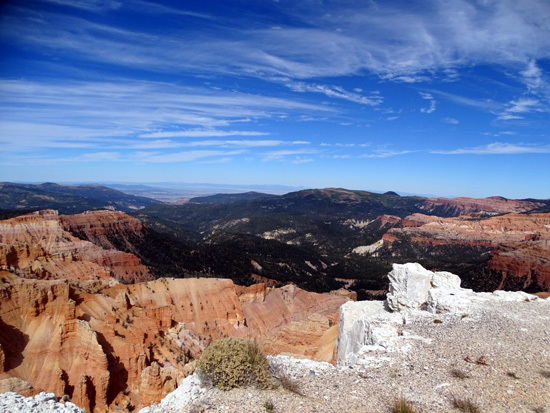 Entry into some national monuments is free. 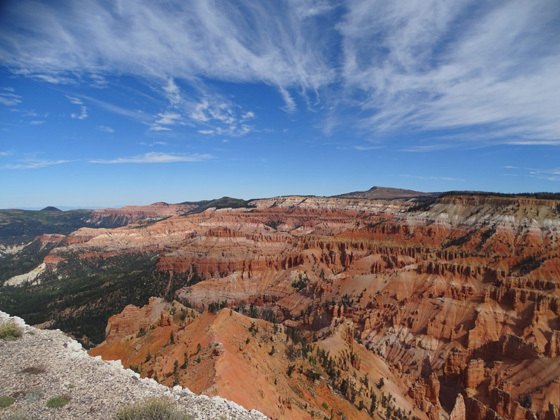 Cedar Breaks charges a small fee to visitors who don't have a national park pass. There is no entrance gate on either Hwy. 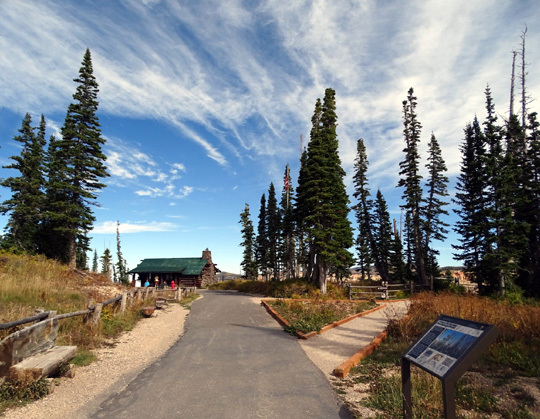 143 or 148 but visitors -- even those with NPS passes -- are expected to stop at the little building near the visitor center on Hwy. 148 and get a pass to hang from their rearview mirror. 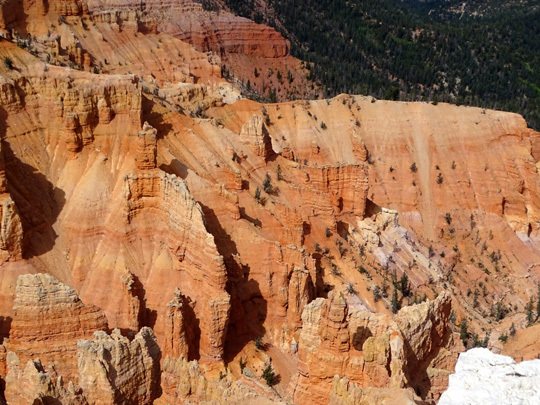 Rangers do go by the overlooks randomly to see if folks have those hang tags. 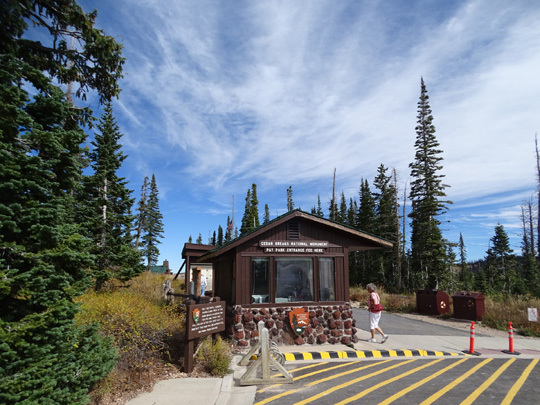 Visitors pass the pay station on the way back to the visitor center and Point Supreme Overlook. a nice, cool place in the summer, and rather chilly in the autumn! 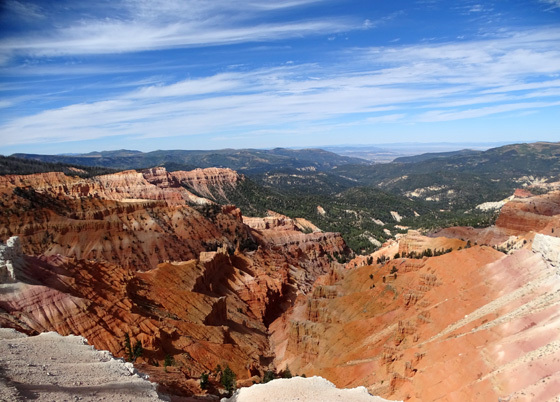 Although the large amphitheater at Cedar Breaks is over three miles in diameter, it isn't as wide as the main Bryce Amphitheater. 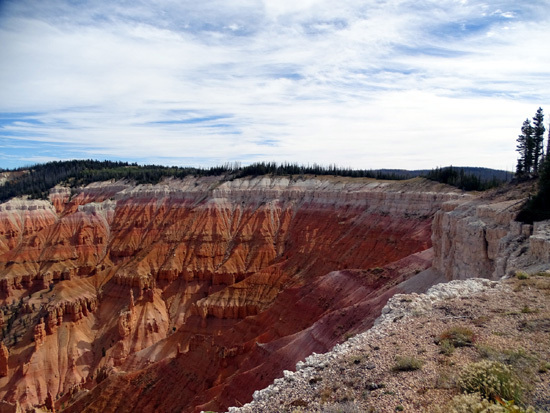 However, it is almost twice as deep as Bryce at 2,000+ feet deep. 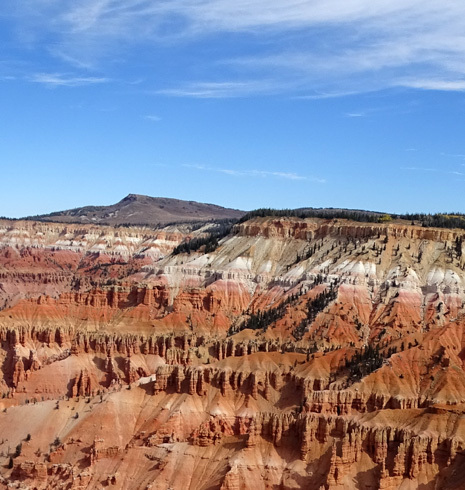 Millions of years of deposition, uplift, and erosion have carved this huge bowl in the steep face on the west side of the Markagunt Plateau. WHAT ELSE TO SEE & DO? 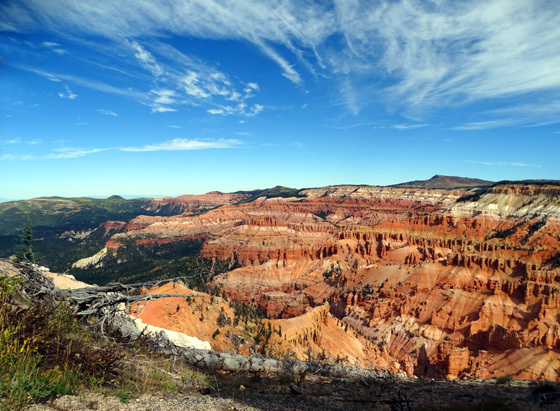 There's more to Cedar Breaks than the signature amphitheater. 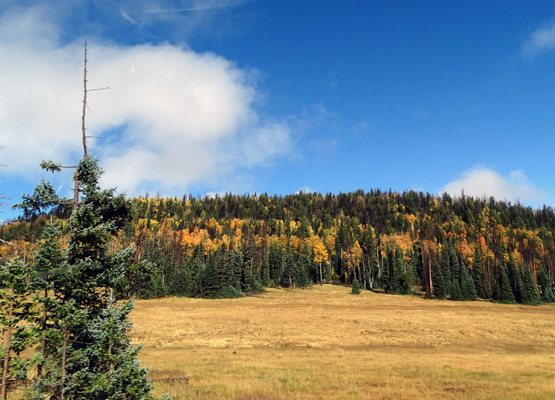 The monument is surrounded by Pike National Forest land with spruce-fir-aspen forests and large sub-alpine meadows full of grasses and seasonal wildflowers. 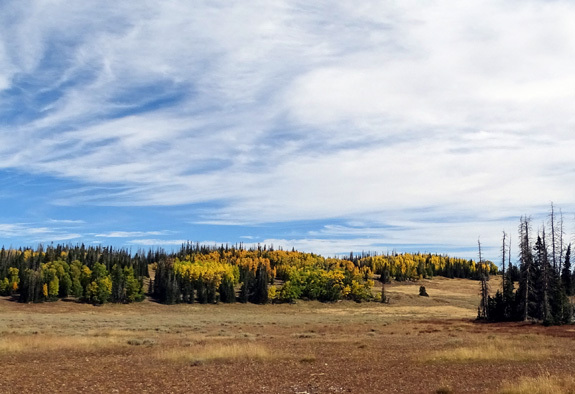 The Markagunt Plateau gets significantly more rain and snow than the desert canyons at lower elevations so it looks and feels very different. 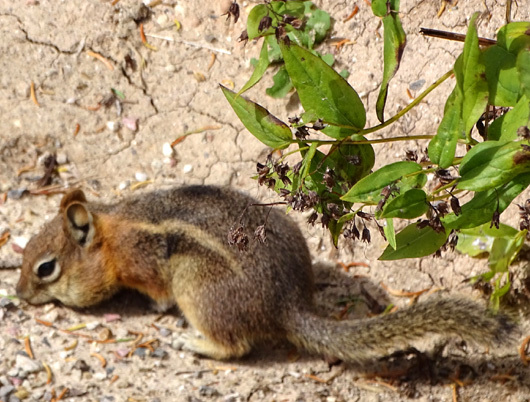 The luxuriant forest retreats and ponds in the high country afford refuge to an abundance of wildlife that includes all sorts of birds, small mammals, and larger species like deer, mountain lions, and black bears. 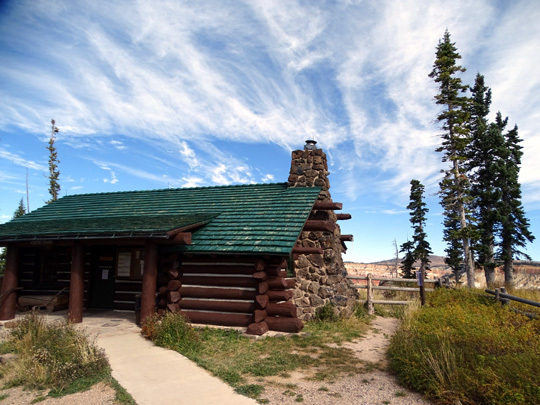 In addition to driving about six miles through the national monument and walking out to all the overlooks, visitors can hike on three trails, ride bikes and horses, camp in the developed campground (open only from mid-June to mid-September because of the high elevation), picnic, watch wildlife, participate in seasonal festivals, attend daily ranger programs and guided hikes, enjoy weekly star-gazing parties, or drive up to Brian Head Peak, which is located just outside the park. 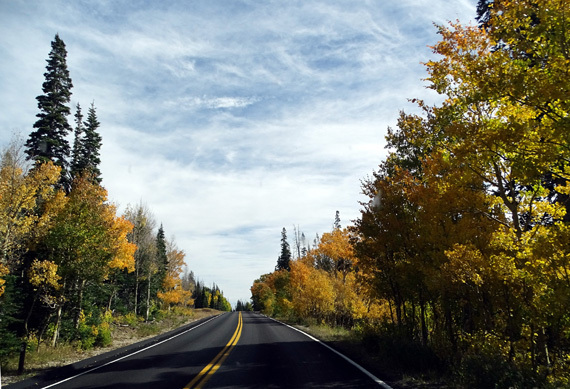 Visitors can also drive up to Brian Head (the town) in the winter and snowshoe or cross-country ski on Hwy. 148 when it is closed. 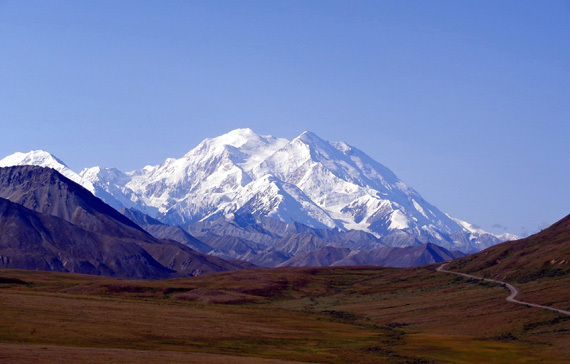 We heard that it doesn't take much snow for the Park Service to close Hwy. 148 at least temporarily in the spring and fall. 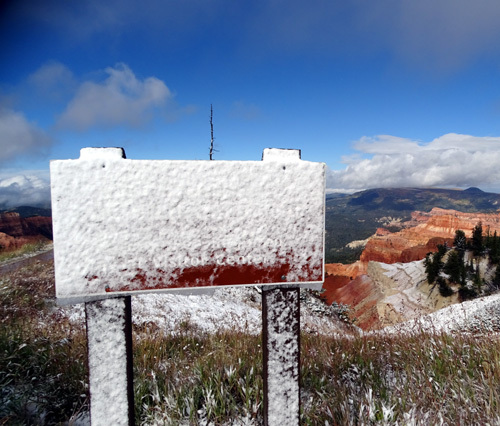 On our second trip to the monument in early October we knew it was snowing up high on the plateau while it was raining down at our campground. 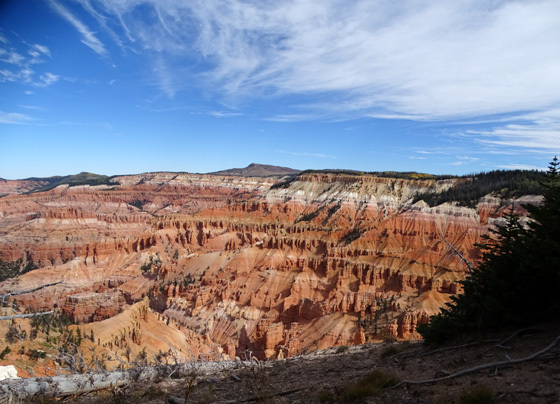 I wanted to see the Cedar Breaks amphitheater with some snow on the colorful rocks so we drove from our campground in Red Canyon to Panguitch, then up Hwy. 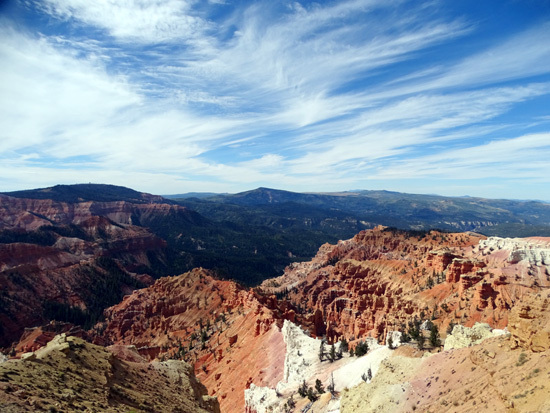 143 to Cedar Breaks. White on white: this time some of the white color IS snow. The dogs had fun playing in the snow for a few minutes. 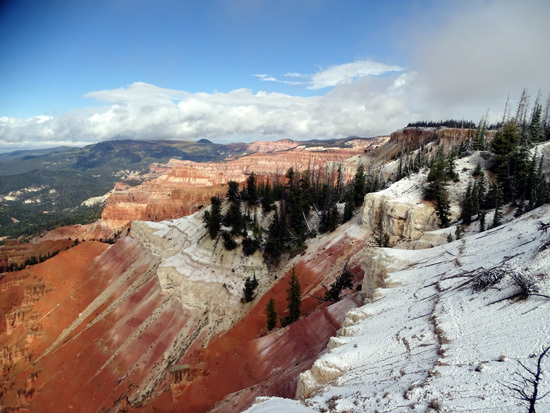 I was happy to have a snow fix and see the colorful rocks with a little snow on them. 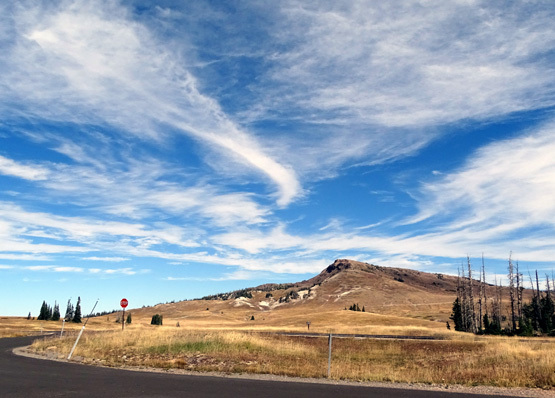 I got some photos of Brian Head Peak, the highest point on the Markagunt Plateau at 11,307 feet, but we didn't drive up to the top until fall of 2016. That's an interesting drive, too. The three-mile dirt road is closed most of the year because of snow but when it's dry it's OK to drive in a 2WD passenger vehicle. May as well go see it, too, while you're in the vicinity. 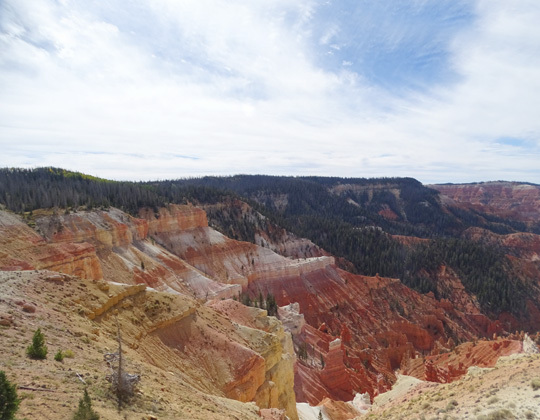 Cedar Breaks doesn't have as much "wow" factor as Bryce and Zion but it's a good place to visit if you want a quiet southern Utah canyon experience without the crowds.